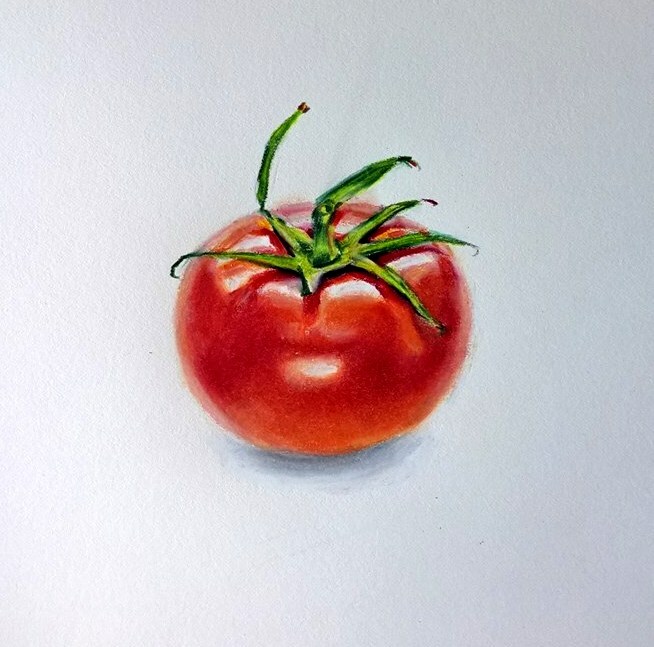 The drawing of a ripe tomato is made with prismacolor wax based artist grade colored pencils on Bristol heavyweight paper. The tomato has seeds and it grows from a flowering plant, botanically it is classed as a fruit not a vegetable.Its color, luster, and almost symmetrical shape makes it a perfect candidate to be painted. This artwork and similar pieces are available in small, medium (up to 24″), and large. The painting is unframed. It is also available in high quality canvas wrap print with sides in black. The price range is based on the lineal sq inch area. For larger sizes’ prices and customized artwork, please contact, Bhavna at bhavna.misra@gmail.com. Being an independent artist, she is open for the reasonable offers. Thank you for visiting this site.